This first-fall white-crowned sparrow is molting. Its head feathers show a little bit of the black-and white pattern it will grow into during the winter. 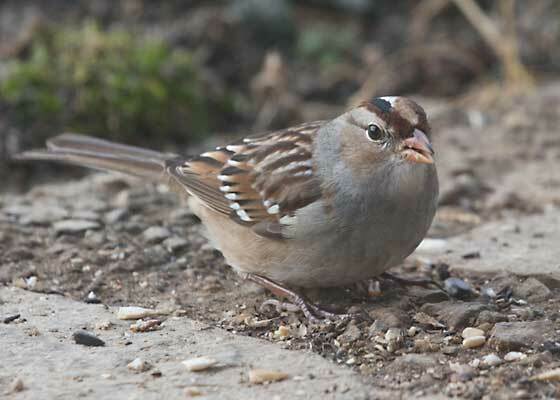 An adult white-crowned sparrow has two black stripes on its crown, separated by a white stripe. Like the one at left. 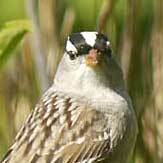 Young white-crowned sparrows have tan stripes, separated by a lighter, buffy stripe. 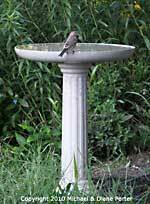 The bird above is part way through the process of exchanging its juvenile plumage for adult feathers. Adolescence. Such a time of mixed signals!